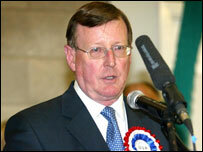 The Ulster Unionist leader and former Northern Ireland first minister, David Trimble, has lost his Upper Bann seat. David Simpson, DUP, beat Mr Trimble by 5,000 votes. It was the fifth seat loss for the UUP and came amid speculation Mr Trimble would soon resign as leader. With all 18 seats declared, the DUP is celebrating an election victory with nine seats, Sinn Fein has five, the SDLP has three and the UUP, one. SDLP leader Mark Durkan won Foyle - a seat held by John Hume since 1983. The DUP took a total of four seats from the UUP. However, the SDLP lost its Newry and Armagh seat to Sinn Fein's Conor Murphy. The seat had been held by deputy leader Seamus Mallon since 1986. In Mid Ulster, Martin McGuinness, Sinn Fein, retained his seat, as did Gerry Adams, West Belfast, Michelle Gildernew, Fermanagh/South Tyrone and Pat Doherty, West Tyrone. The SDLP's Eddie McGrady held his South Down seat. William McCrea, DUP, took the South Antrim seat from David Burnside of the UUP. 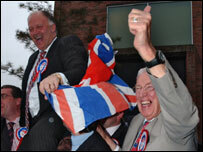 The DUP's Sammy Wilson took East Antrim from Ulster Unionist Roy Beggs. Mr Wilson polled twice as many votes as Mr Beggs, who had been an MP for 22 years. Following his defeat, Mr Trimble said: "I believe the situation in Northern Ireland is now a much better one as a result of what we have done." In a statement on Friday night, UUP chairman James Cooper, said the party was "bitterly disappointed" at the election results. "It raises a number of questions at a strategic and political level within the party that we will reflect on over the course of this weekend and in the months ahead as we seeks to rebuild trust," he said. David Simpson said of his own victory over Mr Trimble: "It sends out a very, very clear signal that push-over unionism has gone forever." DUP leader Ian Paisley said Mr Trimble had beaten himself, adding: "David Trimble took the wrong road".The SDLP's Alasdair McDonnell had a surprise win in South Belfast, taking the seat from the UUP. Jimmy Spratt of the DUP came in second place. Iris Robinson of the DUP retained her seat in Strangford, Jeffrey Donaldson of the DUP retained his Lagan Valley seat, whilst DUP leader Ian Paisley retained his North Antrim seat. Sinn Fein's Gerry Adams was re-elected in West Belfast and the UUP's Sylvia Hermon retained her seat in North Down. Peter Robinson of the DUP retained his East Belfast seat, his party colleague Nigel Dodds held his North Belfast seat and Gregory Campbell of the DUP held his seat in East Londonderry. Sinn Fein's Michelle Gildernew retained her seat in Fermanagh/South Tyrone and her party colleague, Pat Doherty, held his seat in South Tyrone. Earlier, Gerry Adams retained his West Belfast seat with 24,348 votes and the SDLP's Alex Attwood came second with 5,033 votes. Mr Adams was confronted by two of the Omagh relatives as he arrived at the count in Belfast City Hall. He made no comment to the protestors. The counting of papers in the local council election does not begin until Monday. A total of 918 people are competing for 582 council seats.